Rice is a staple part of the diet in many countries around the world supplying much-needed daily calories. When I’m cooking rice, I usually rinse it a few times and throw away the water until it rinses clear before cooking. I never knew the rice water was useful for hair and skin until recently. Rice water is the milky starchy fluid that rises to the top of the pot when cooking rice or after rinsing rice. It has been used by Asian women for centuries in the treatment of hair and skin. In Japan, female rice farmers used to bathe and wash in rice water. 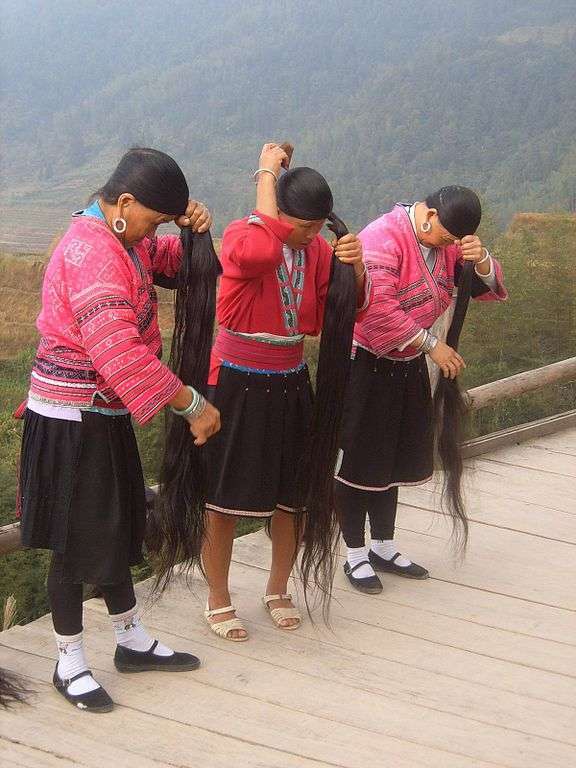 Yao women in the Chinese province of Huangluo are known for their very long, shiny, grey-free hair well into their 80s. These women have hair so long, they made it into the Guinness Book of Records. So what’s their secret? They wash their hair with fermented rice water. What is Fermented Rice Water? Fermented rice water is water that has been prepared in the same way as above but left to ferment and turn slightly sour. The benefits of rice water are further enhanced when it’s left to ferment. Rice water contains vitamin B, C & E.
Rice water contains inositol, a carbohydrate that helps repair and strengthen damaged hair. This carbohydrate also helps boost hair elasticity. 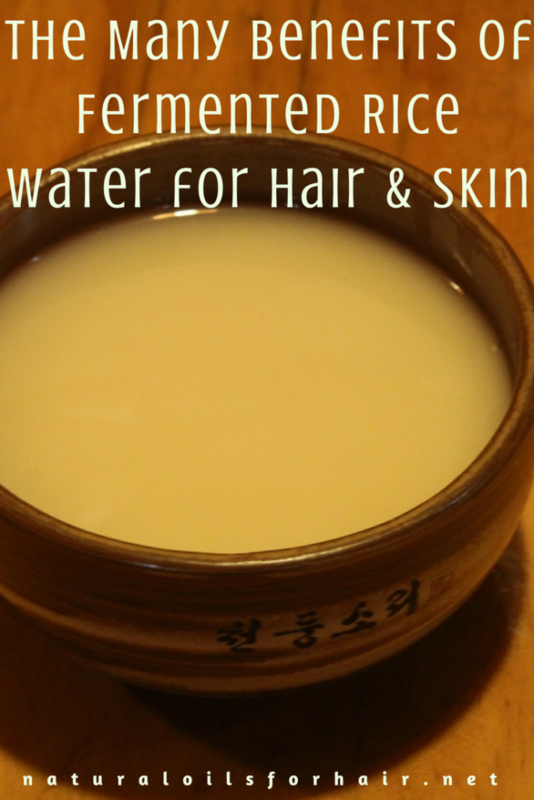 Rice water has saponins, a natural cleanser for hair thus making it suitable for washing hair. It also contains phenolic and flavonoid compounds, which can minimize free radical damage from environmental factors. Rice water contains minerals that can help tighten skin and shrink pores. Rice water helps reduce redness from acne and clear blemishes. The starch in rice water can also soothe inflammation from skin conditions such as eczema. Cleansing your face with rice water helps improve overall complexion. Rinse any type of rice (white, brown, jasmine, basmati, etc) then soak the rice in additional water for 20 minutes. Strain and pour into a glass container. This is the no boiling method. Boil the rice in more than the usual amount of water. When the starch rises to the top, drain the rice. You can continue cooking the rice to eat later if you want. The process of fermented rice water is a little bit different from plain rice water. Rinse a cup of rice then discard the water. Steep the rice in 2 cups of distilled water for about 20 minutes stirring every 5 minutes or so. Afterward, strain the water into a bottle and set aside overnight. By the next morning, it should have turned slightly sour and started to ferment. Pour the rice water into a pan, cook until boiling then remove from the stove and allow to cool. Add a few drops of your preferred essential oils such as ylang ylang essential oil or lavender essential oil. You can also add 5 drops of vitamin E oil. Rice water should last up to a week when kept in the fridge. Always make a fresh batch afterward. After cleansing your face, soak a cotton ball with rice water and apply all over your face. Let dry then apply your moisturizer. You can also use rice water as a liquid base in a moisturizing face mask. Once a week, use the rice water like shampoo or use it as a final rinse. It is pH balanced and great as a final step before applying a leave-in conditioner. Rice water is concentrated and quite strong so dilute every cup of rice water with about 2 cups of distilled water. Women with postpartum shedding have reported excellent improvement after including rice water rinsing in their regimen. Your hair might not like it as a final rinse so use it as a shampoo instead, followed by the rest of your regimen. Plain Rice Water vs Fermented Rice Water. Which is Best? Fermentation helps lower the pH levels of rice water making it similar to our hair’s pH level. Finalizing your regimen with a balanced pH product helps close your cuticles and help it lay flat. Fermented rice water also has enhanced vitamins and nutrients compared to plain rice water. 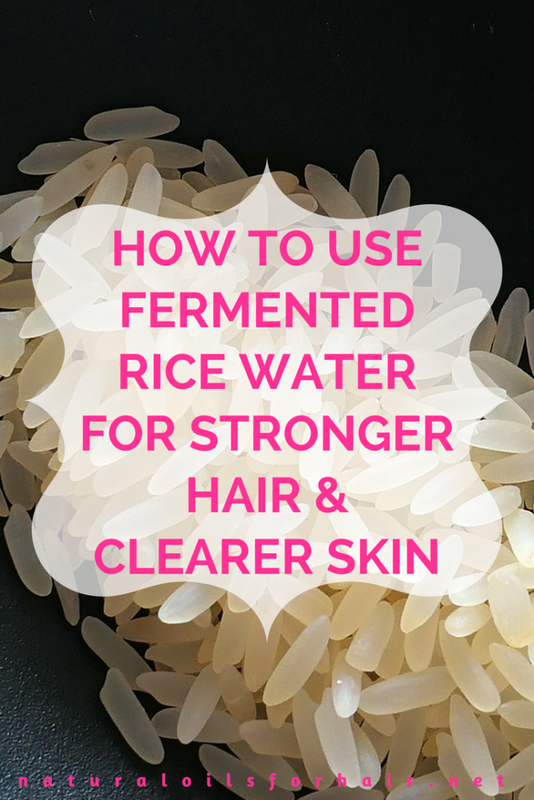 While rice water also has a low pH, fermented rice water is best for hair and skin. Nevertheless, everybody’s hair and skin react differently to products so feel free to try both and judge for yourself. Also, play with the ratio of rice water to distilled water and see which concentration your hair likes best. 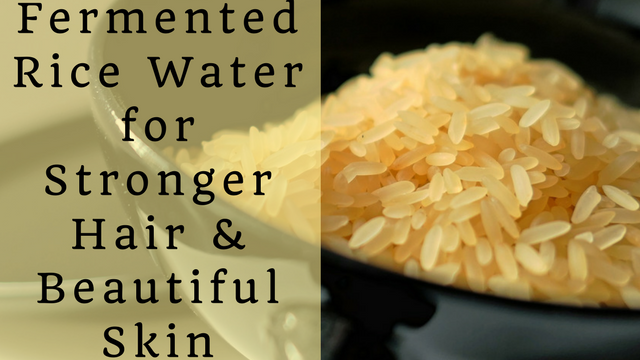 Rice water or fermented rice water is simple and easy to make yet very effective for hair and skin care. One of the many ingredients in your kitchen that goes farther than commercial products. I am currently wearing my hair in a protective style for the next 3 months and will be moisturizing with rice water for the duration. Can you add tea tree oil? That say’s it can prevent hair loss and restore damaged to the hair as well as growing? Yes you can add tea tree oil. I suggested lavender and ylang ylang because they have a pleasant fragrance as well but you can substitute with other essential oils based on your goal. Be sure to massage it into your scalp thoroughly before rinsing out. I totally jumped ahead and added my oil(peppermint essential oil) before fermenting. Did I mess up the batch too bad? I hope not, lol. I am a college student and I am writing a paper about the Yao women and their hair. I am trying to cite this page and I was wondering when this article was written and what your last name is?